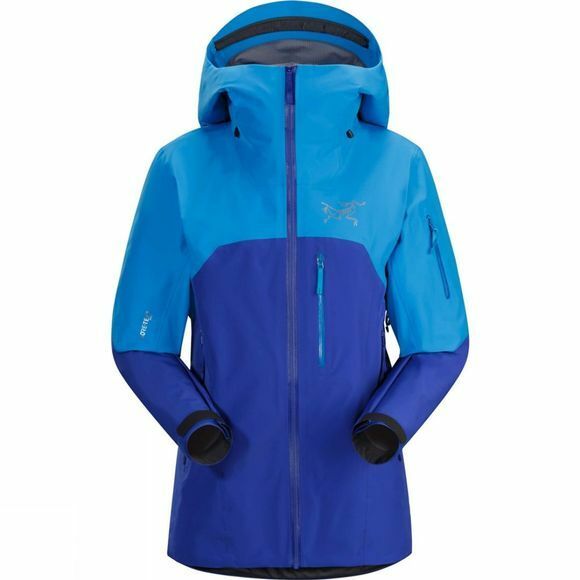 The design and features of the Arc'teryx Women's Shashka Jacket have been optimised for big mountain skiing and freeriding. Constructed from three-layer Gore-Tex with soft shell construction, the jacket is windproof, waterproof and has a soft brushed liner for light insulation. The women-specific design optimises the fit, and articulation through the shoulders and sleeves provides advanced freedom of movement during descents. The relaxed fit layers easily and has modern styling and a contemporary look. Water-resistant pit zips add the ventilation necessary on ascents, and external pocket location is carefully selected to provide easy access with a pack on. An internal laminated pocket secures and protects a smartphone, wallet or RFID lift ticket, and the indispensible internal mesh dump pockets stashes skins, gloves, a warm hat or goggles. Large cuffs fit easily over or under gloves, the water-resistant Vislon front zip won't accumulate snow, and the helmet-compatible StormHood secures with a single hand and delivers full protection with maximum visibility. The Slide'n Loc attachments link to compatible pants to create a snowproof system that works as a single unit.